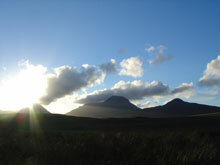 The 1950's saw plans to reopen the Isle of Jura distillery. To solve the problem of work for the islanders estate owners Robin Fletcher and Mr Riley-Smith got together with former distiller and architect Delme Evans to design and build the new distillery which opened on 26th April 1963. 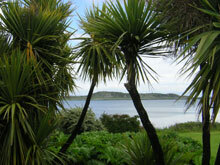 Illegal distilling probably dates back to 1600's on this remote island. George Orwell wrote his famed novel "1984" on Jura, attracted there by the island's remoteness giving him the peace he needed to write. The soft peaty water is good for making whisky and the very plain malt dried using warm air contributes to Jura's lighter and softer finish. A significant difference is made to the style of Jura's whisky by the stills which are very tall and it is a much lighter alcohol which goes over the top creating a lighter whisky. 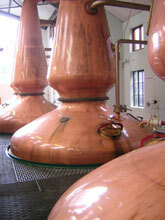 The cask is very important as it contributes to the flavour of the whisky. 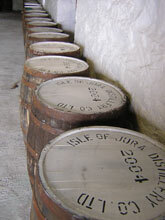 Isle of Jura uses American white oak in the main with some sherry casks. Isle of Jura 36 year old Single Malt Special Collectors Edition won a Gold World Medal at the New York Festivals Awards 2002. The people at Jura tell us "......the whole character of the place, mainly through the water we use and the conditions we mature it in, the fact that we're sitting beside the sea with salty air help to give Jura whisky its unique taste." Please note: our distillery will be closed between Tuesday 19th July - Monday 8th August with no tours taking place.